Shine on you crazy searchlight! One of the more unusual trophies brought back to Canada was this 120cm Siemens-Schuckert German Searchlight captured by Australians near Roy, Belgium (possibly the 14th battalion). It would have been used for anti-aircraft defence at night. This light was put on display in the war trophy exhibits, kept by the public archives in their trophies shed, and today is in the Canadian War Museum’s collection. It is in decent shape but won’t be lighting anyone up any time soon! Below is a photo of it in the Public Archives’ War Trophies Annex building along with a massive SN 1650 lb. British bomb (also now at the CWM) intended for bombing raids over Germany by heavy bombers such as the Handley Page 0/400. 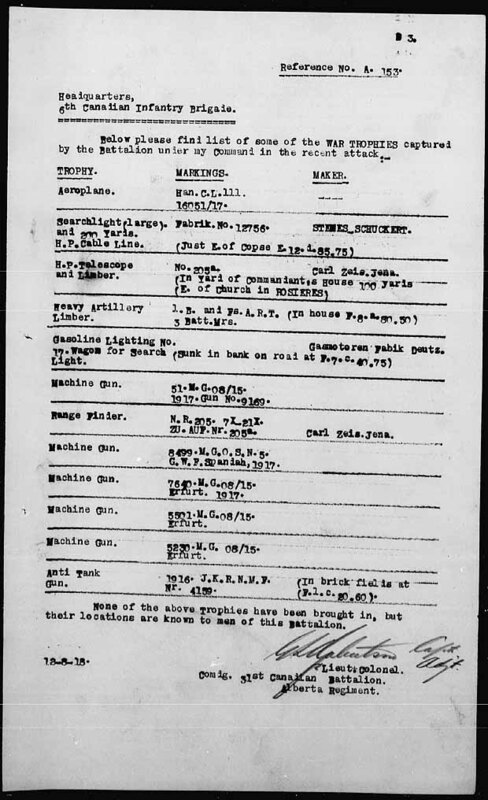 There was a similar or identical Siemens-Schukert large searchlight captured by the 31st Battalion (Alberta) during the Amiens Offensive, but this light was described as having not been brought in, and does not seem to have ever been recovered by a Canadian unit (from the War Diary report on Ops. here). The last postcard here also shows a very similar unit (from an Austrian searchlight unit) being towed by mechanical transport with its crew.